Delhi is a sprawling metropolis that became India's capital in 1931. It is home to almost 20 million and divided into two distinct areas: Old and New Delhi. Old Delhi, the capital of Islamic India, will immerse the visitor in noise, pollution, history and beauty in equal measure. 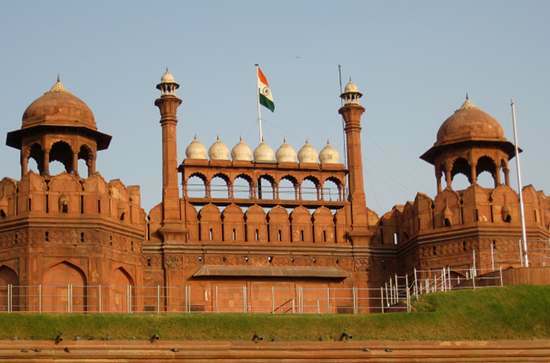 Spending a day exploring the Red Fort is a particularly captivating experience. Designed by British architect team Sir Edwin Lutyens and Sir Herbert Baker, New Delhi was constructed between 1911 and 1931 following the British government's decision to move the capital of the Raj from Calcutta. It is spacious, ordered and far more western. There is, nonetheless, plenty to see, including the grand Presidential Palace. Located in the north-eastern corner of Old Delhi, the Red Fort is a seventeenth century fort complex constructed by Mogul Emperor Shan Jahan. The Fort, which remained the Mogul capital until 1857, and was recently named a UNESCO world heritage site, comprises a number of buildings surrounded by defensive walls and moats. The walls, made from red sandstone (pictured), have a circumference of two kilometres and a height of between 18 and 33 metres. The Fort's buildings, surrounded by well-tended formal gardens, fuse Indian, Persian and European design. 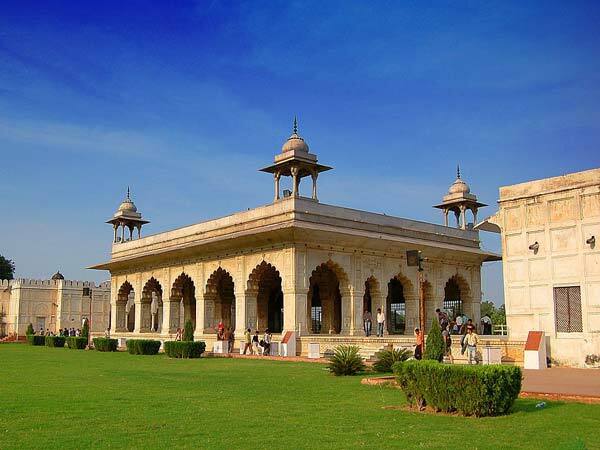 The most spectacular parts of the Red Fort include the Diwan-i-Khas, an ornately decorated open hall used by Mogul emperors for giving private audiences, and the Moti Masjid (or Pearl Mosque), a small, three-domed mosque carved in white marble. The Indian Prime Minister addresses the nation from the Fort on Independence Day each year (15 August). where? Netaji Subhash Marg, New Delhi. The closest metro station is Chandni Chowk. when? Tuesdays to Sundays, sunrise to sunset. Closed Mondays. £$€¥ 250 Rupees for foreigners; 10 Rupees for Indians. Built between 1911 and 1930, the Presidential Palace (aka the Viceroy's House and Rashtrapati Bhaven) is the official residence of the Indian President. With 360 rooms occupying 200,000 square metres, the Palace—constructed from 700 million bricks—is the largest residence of any head of state. It was built following King George V's decision to move the Indian capital from Calcutta, and designed by Luytens in an Indian-influenced classical style. The building is constructed around a large square with numerous smaller courtyards. It has two wings: one for the President and other permanent residents, the second for guests. Durbar Hall, known as the Throne Room during British Rule, is located in the centre of the main wing; it is used for ceremonial occasions, and has as its centrepiece a two-tonne chandelier suspended from a 33 metre-high ceiling. Other important rooms include the Yellow Drawing Room (used for smaller state functions, such as the swearing in of important officials) and the wood-panelled Banquet Hall (which can seat up to 104 and displays portraits of India's former premiers). The Palace's most striking external feature is its central dome, inspired by the Pantheon of Rome, standing at twice the height of the remainder of the building. Its grounds house the Jaipur Column, a 145-foot high structure crowned by a bronze lotus and six-pointed glass star. 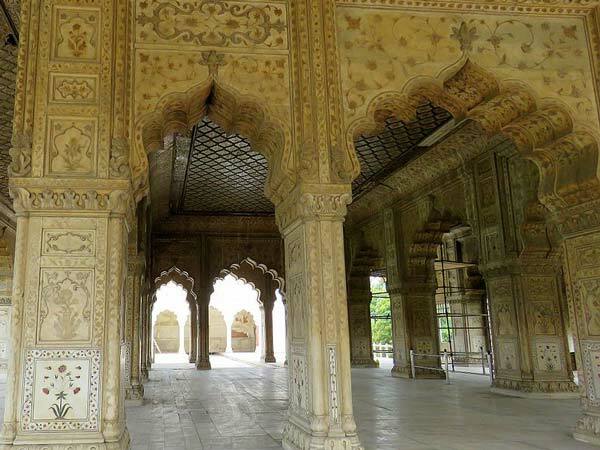 The Palace's 130 hectare formal Moghul Gardens are open to the public once a year. where? Raisina Hill, New Delhi. when? 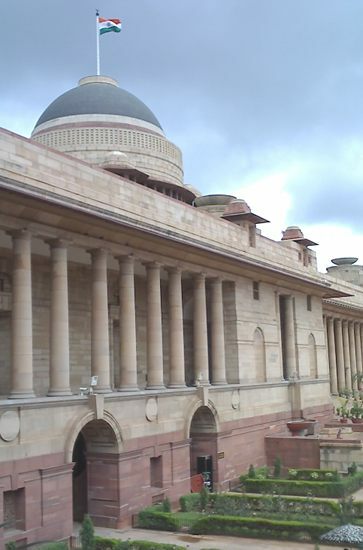 Prior permission of the Indian Tourist Office is needed to enter the Palace. Its grounds are open to the public in February. 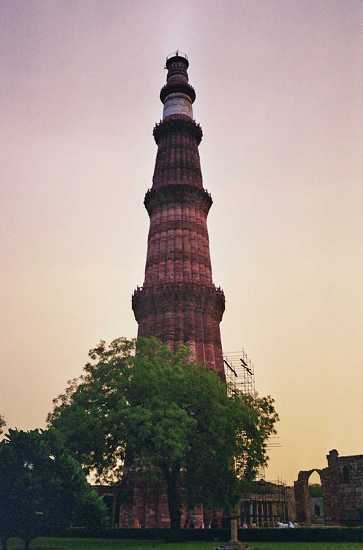 Awarded World Heritage status in 1993, the Qutab Minaret is a 72.5 metre-high tower found to the south of Delhi. 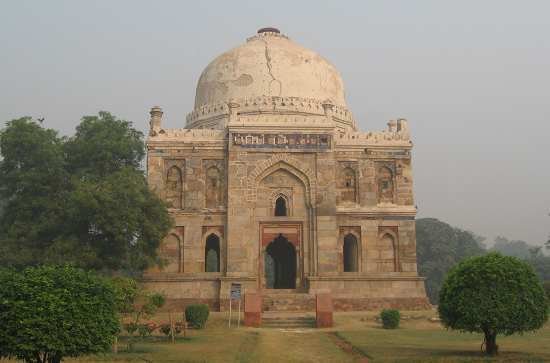 Initial work commenced in 1192 and finished in 1198, on the orders of Qutb-ud-din Aibak (the first Islamic ruler of Delhi). Further work was carried out in the 13th and early 14th centuries, and periodically thereafter to restore damage caused by lightening strikes. The Minaret, constructed from red and buff sandstone, is the tallest stone tower in India: it has a diameter of over 14 metres at its base, tapering to 2.7 metres at its apex, and is decorated with alternating angular and rounded flutings, five ornamental balconies, and intricate carvings from verses of the Qur'an. The reason for the Minaret's construction is unclear, as it is difficult to hear a call to prayer made from the top; the most likely theory is that it was built to commemorate a victory in battle. where? Aurobindo Marg, near Mehrauli, Delhi (16 kms from Connaught Place). Take a local bus or an auto-rickshaw. when? 10 am to 4pm. £$€¥ 250 Rupees for foreigners (10 Rupees for Indians). Lodi Gardens is a 90-acre public park in the centre of New Delhi. Popular for its beauty and tranquillity, the Gardens are a particular draw for walkers, joggers and yoga enthusiasts. The Gardens feature a number of tombs, the oldest of which is the fifteenth century tomb of Mohammed Shah (the last ruler of the Sayyid dynasty); this octagonal structure, with verandas and three open arches on each side, contains eight graves. Other impressive structures are dotted around the Gardens, in particular the colourful and intricately carved Bara Gumbad (pictured) and the Sheesh Gumbad. The Gardens are well maintained, and contain a number of lakes, ponds and paths as well as a rose garden and the National Bonsai Park. The Gardens also attract wildlife, including parakeets, kites, kingfishers and (unfortunately) stray dogs. where? 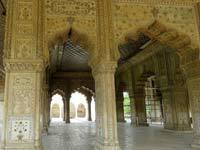 The Gardens are found between Khan Market and Safdarjung's Tomb on Lodi Road. when? From sunrise to sunset.